Individual papers (15 min) or complete sessions (3-4 papers), from members of the Wyoming Humanities community, including colleagues at colleges, museums, and other institutions around the state, were presented. The first annual Eric Sandeen Honorary Lecture in the Humanities was presented by Caroline McCracken-Flesher, entitled "Writers on the Rails." Classroom Building 103, Noon to 1:00 p.m.
Paul Sturtevant is a Visiting Research Specialist for the Smithsonian Institution, editor of The Public Medievalist, and author of The Middle Ages in Popular Imagination: Memory, Film and Medievalism. Massimo Pigliucci is Professor of Philosophy at CUNY-City College, formerly co-host of the Rationally Speaking Podcast, and formerly the editor in chief for the online magazine Scientia Salon. The Department of Philosophy and Religious Studies, along with WIHR, is sponsoring Massimo Pigliucci’s visit from 8-10 October. There will be a public seminar (“Stoicism as a Philosophy of Life”) on Tuesday, 9 October at 7 pm in the Business Auditorium. There is also a reading group (How to be a Stoic) taking place on Monday, 8 October, from 3-5 pm; please contact Susanna Goodin (goodin@uwyo.edu) if you are interested in participating in the reading group. Visual Arts Lobby, 7:00 p.m.
Coe Library, Room 506, 4:10 p.m.
Wyoming Union Ballroom, 3:00 p.m. Colleagues are invited to present their favorite paper of the year, or their work in progress, at a conference to honor Eric Sandeen in his retirement. All colleagues are welcome to present work that engages with the humanities. Eric Sandeen is the longtime director of American Studies, and founding director of UW’s Wyoming Institute for Humanities Research. We can think of no better way to celebrate Eric than by showcasing the work he has given a career to promote. Please send titles for 20-minute papers with humanities resonance to cmf@uwyo.edu by September 15th 2017. The conference program, describing the variety of talks presented, can be seen on this document. Gateway Center, 4:30 - 6:00 p.m. Interested people enjoyed the events listed on the Spring 2017 poster. Business Building 10, 4:15 p.m.
Community halls have served as important social and cultural centers in many rural areas of Wyoming for over 100 years. They are the location for club meetings, holiday parties, wedding receptions, polling places, dances, 4-H meetings, and other events serving a widely dispersed population. This research, from the perspective of a folklorist, focuses on creativity and community—how people express their need for beauty in their everyday lives, and how they maintain connections to the groups that make them who they are, be they familial, occupational, regional, ethnic, or religious. The presentation will explore how communities organized and funded the construction and maintenance of community halls, how they were used and how those uses changed over time, and why some have fallen into disuse and others are still active. Community halls are a tangible expression of the need for community in a local area, and a creative solution to making a space for people to gather. Business Building 129, 5:00 - 7;00 p.m.
Nowadays, artists and scientists tend to think of their ways of probing the world as distinctly different. But such was not always the case (in fact the divide is only a few centuries old; think of Leonardo, think of the wonder cabinets of the seventeenth century). Nor may the differences be all that distinct or even real. In a lecture originally developed for a conference sponsored by the National Science Foundation, longtime New Yorker writer Lawrence Weschler--director emeritus of the New York Institute for the Humanities at NYU (where the sciences were emphatically included as part of and central to the humanities) and author, among others, of "Mr. Wilson's Cabinet of Wonder" and "Everything that Rises: A Book of Convergences"--will extrapolate on such themes, with side-meanders into the thinking of artists Robert Irwin and David Hockney (subjects of his two most recent books) and a whole new interpretation of Rembrandt's Anatomy Lesson. Art Museum, 5:00 - 6:30 p.m. This talk was cancelled. Please check for its rescheduling in the fall. Coe Library 506, 4:30 - 5:45 p.m.
Lena Connell was one of a small group of women suffrage photographers in Edwardian period England who established a palatable image of British women activists for the press and an admiring public through her formal portraits. I argue that her portraits offer a new way of seeing women who, for the first time in their lives, en masse, were crossing the threshold of the domestic realm to embrace a public one. I will share portraits as part of an examination of an art-as-propaganda moment, as the suffragists surged forward in their fight for votes for women between 1906-1914.
Business Building 23, 4:15 - 5:15 p.m. In my presentation I will look closely at two museum sites, the Rock and Roll Hall of Fame in Cleveland, Ohio, and the Museum of Pop Culture in Seattle, Washington, in the context of the field of museum studies. I analyze how their representations of popular music, in particular their depictions of electric guitars, echo as well as shape racialized, gendered, and otherwise “identified” views of what can loosely be defined as rock and roll. While the Rock Hall largely strives to preserve a canonical version of the genre and primarily speaks to a baby-boomer audience, MoPOP offers a more interactive and broadly focused view of popular culture that includes rock and roll as one of many elements. Yet, even the more liberatory approach of MoPOP is clearly tied to capitalist notions of popular music distribution and commodification. Coe Library 121, 4:15 - 5:15 p.m. The war of 1640 was a singular conflict in that it came to be not only a physical fight but also a propagandistic one. Printed pages were as powerful as guns. Anonymous authors created hundreds of gazettes, notices, poems, and songs during the twelve years of the campaign, transforming the revolt of Catalonia into a war of papers. Profoundly interdisciplinary in its scope, The 17th century play, The Arrival of the Marquis de los Velez to Catalonia, is a riveting eyewitness account of a modern war. Business Building 24, 4;15 p.m. Professor Flesher was a recipient of a 2016 WIHR Summer Fellowship. In the study of ancient Judaism, our portrayal of worship largely derives from textual evidence, from the Bible to the Dead Sea scrolls and rabbinic literature, and everything in between. Missing from the picture has been the archaeology of synagogues where such worship took place. This talk takes what we know about synagogue worship in the first century CE and portrays it in the archaeological remains of actual first-century synagogues. This move highlights the dynamics of worship and social interaction different synagogue plans encourage, and casts different interpretative perspectives on the Gospel of Luke’s story of Jesus reading Scripture in the Nazareth synagogue. Business Room 127, 3:15 p.m. It did not take much time after November 8th to find academics making the point that the results of the elections called for a renewed commitment with university education, particularly, with the humanities. Given the outrage about the election results and the overwhelming environment of hate and open rejection of historical analysis and scientific facts that were present during the presidential campaign, it was not a bad moment to remind liberal political leaders that their support of measures to de-invest in public higher education may have contributed to the outcome, including the current neo-fascist populist trends. Yet, such defense of the university and the humanities is premature before a serious consideration of the extent to which, generally speaking, the university as a whole and the humanities in particular have been complicit with a post-racial view of our age that served as a generative background for the emergence of more open forms of racism than we have seen since a few decades before the election of the first African American President. The contemporary crises of the research university and the humanities have to be put in the context of a larger crisis about the meaning and significance of evidence and facts, as well as of the desegregation and decolonization of bodies, cultures, and knowledge in contemporary U.S. society. The context calls for the exploration of transdisciplinary decolonial epistemic formations that are able to identify the linkages between liberalism and fascism as well as between the call for tolerance in the traditional humanities and the crisis of "diversity" in institutions of higher learning and in society. In short, for the humanities to prove their relevance today they have to transit from post-racialism to decolonization. Professor Maldonado-Torres is an Associate Professor at the Department of Latino and Caribbean Studies and the Comparative Literature Program of Rutgers University. Business Building Room 129, 6:00 p.m. Recent decades have seen increasing numbers of women in U. S. public service as elected and career officials. Yet progress has been slow, a glass ceiling remains, and women’s salaries have continued to lag behind men’s. Prof. Stivers will unpack some of the taken-for-granted gender assumptions that continue to restrict women’s public activities and highlight some of the contributions women have made to the public good as they struggled to find an equal place in public service. Thursday, November 10th, 4:30 p.m.
Heart Mountain is a striking landmark in northwest Wyoming that has oriented multiple communities including the Apsáalooke (Crow); settlers and Buffalo Bill; 10,000 Japanese Americans at the Internment Camp; GIs with homesteads; contemporary ecologists at the Nature Conservancy’s Heart Mountain ranch. Our interdisciplinary team consists of historian of religions Dr. Mary L. Keller, UW, Dr. Tim McCleary, Head of Crow Studies at Little Big Horn Tribal College, and Dr. Ramesh Sivanpillai of WYGIS. We will describe the foundation for methodology and platform of the Electronic Cultural Atlas (ECA), whose long-term goal is depicting searchable cultural landscapes with embedded multimedia. We have a special opportunity to talk with Sam Western, author of the 2002 study of Wyoming’s economy and culture, "Pushed Off the Mountain, Sold Down the River." Western is writing a sequel to that volume and teaching a course on Wyoming futures at Sheridan College in which he asks a series of provocative questions, extracted below from an editorial in the Sheridan Press (http://thesheridanpress.com/?p=58104). To this the WIHR faculty can add at least one: What role can/will/must the humanities have in shaping Wyoming’s future? Both events at Berry Center, 5:30 to 7:30. History Building Room 155, 4:00 p.m.
Light refreshments following the presentation. Visual Arts Building, Room 111, Noon. Susan Oliver’s talk, “Transatlantic Magazines and the Rise of Environmental Journalism in the Nineteenth Century,” considers how a culture of transatlantic environmental journalism emerged during the early to middle decades of the nineteenth century. Jonathan White’s talk, “Retracing in Balzac a Socio-Cultural Archaeology of Paris,” examines a remarkable 19th century literary figure and his startlingly prescient description of the modern city of danger and violence. Classroom Building 222, 3:00 p.m.
"The Long Arm of the Past: State Violence and the Enduring Logic of Mass Criminalization"
Dr. Muhammad is the Director of the Schomburg Center for Research in Black Culture at the New York Public Library. Classroom Building 215, 4:15 p.m.
You can find a biography of Dr. Breyfogle at http://www.aspeninstitute.org/people/todd-breyfogle. Classroom Building 214, 4:15 p.m.
"The Great Mistake: How Private-Sector Models Damage Public Universities, and How they Can Recover"
This lecture offers an overview of how privatizing public colleges has made them more expensive for students while lowering their educational value, and will outline more productive policy directions. Christopher Newfield is Professor of literature and American studies at the University of California, Santa Barbara. More information can be found on the flyer. Please join the Wyoming Institute for Humanities Research at the Cooper House at 7:00 for short presentations from grant winners Ekaterina Alexandrova, Rebecca Steele and Bunny Logan. Light refreshments will be served. Click on the names for more information about the grant winners research. WIHR presents distinguished guest lecturer, Harvard professor Dr. Louis Menand at the University of Wyoming. The lecture, entitled "Hannah Arendt on Totalitarianism", was held on October 1st. Abstract: In 1951 the noted political theorist and German émigré Hannah Arendt, published The Origins of Totalitarianism, which became one of the most important lenses through which Nazism, anti-Semitism, and the holocaust of World War II could be understood. Dr. Menand discusses the book in the context of the Cold War and in terms of Arendt's relationship with the influential philosopher Martin Heidegger. He also assesses the book's important stature in the literature of totalitarianism. NEH Summer Stipend Workshop, Fri., 5/8/15 from 1:10-2:30 in the College of Business, Room 208. Prepare now, for the mid-September deadline. If you know you would like to attend, contact Dr. Susanna Goodin at goodin@uwyo.edu. Drop-ins are welcome. The workshop will cover the general guidelines for the Summer Stipend, will go over the basic ranking system used by the NEH, and will have past UW winners and those faculty who served on the UW selection committee available to answer questions. The Ucross Experiment; Cross Pollination of Arts and Sciences will be provide a documentary film, "World Premier," on Thursday, April 30, 2015 at 7:00 p.m. in the Gryphon Theatre. The event is free and open to the public with doors opening at 6:30 p.m.
Abstract: In the summer of 2014, artists and scientists gathered for an experiment in cultivating an understanding of the land and people of Wyoming. Working at the Ucross Ranch with the sponsorship of WIHR, the Wyoming Humanities Council, and other organization, the participants sought to catalyze mutual respect and deep conversation founded on humanist inquiry. Collaborative research, informal conversations, and public presentations fostered lasting, scholarly relationships that will unfold on a continuing basis to yield socially valuable and intellectually compelling formulations of the humanities at UW through art and science, two of Western culture’s most abiding approaches to comprehending ourselves and our place in the world. According to Jeff Lockwood, the Experiment's impresario, "the environmental problems that we face are the products of our being fully human—biophysical, technological, sociopolitical, economic, historical, rational, emotional, creative, moral, and spiritual creatures—and the stakes are too high for us to retreat from the powerful questions posed by the humanities." Goode Family Excellence Fund Lecture, in part with the Don Quixote program, will have guest speaker Professor Steven Hutchinson, of the University of Wisconsin-Madison, to present "Narrating the Return Journey," on Saturday April 25, 2015 at 5:00 p.m. in the Business Building Room 57. WIHR Symposium, "Hunting: A Humanities Conversation." The symposium is prompted by the State Museum's current display, The Art of the Hunt, in Cheyenne. This is a collaborative project between the Wyoming Arts Council and the UW American Studies Program. There will be two events with Distinguished Professor, Jan Dizard, of Amherst College. Hosted by Dr. John Dorst. Dr. Dizard will present "What Made Hunting in the US a Model of Conservation and What Now Threatens That Model?" on Friday, April 24, 2015 at 4:10 p.m. in the Classroom Building, Room 310. A roundtable discussion with Dr. Jan Dizard will be held on Saturday, April 25, 2015 at 10:00 in the Berry Biodiversity Center Auditorium, "Hunting and the Humanities." Light refreshments will be served at 9:00 a.m.
Don Quixote in the American West: A Fourth-Centenary Celebration. Click here for program details. Co-sponsored talk on Japanese Magna, Friday, April 10, 2015 at 4:00 in the Business Auditorium. More information tba. The Office of Research and Economic Development will sponsor, "Write Winning Grant Proposals for the Humanities and Arts," on Wednesday, January 14, 2015 from 8:30 a.m. - 4:30 p.m. Reservations are required. Contact Angela Faxon at afaxon@uwyo.edu or Rachel Sailor at rsailor@uwyo.edu. Dr. Jim Harris, Andrew W Mellon Foundation Teaching Curator at the Ashmolean Museum of Art and Archaeology, University of Oxford, presented "Agile Objects, Agile Minds: Teaching and Learning in the University Museum" on Tuesday, December 9, 2014. Dr. Peter Kaufman, Professor at the University of Richmond, presented "Such Large Discourse: Leadership and the Humanities" at 4:00 p.m. in the Classroom Building, Room 129. A public reception will follow the lecture. “Reconstructing the View: The Grand Canyon Photographs of Mark Klett and Byron Wolfe” Thursday, Oct. 30th. at 7:00 in the Visual Arts Building, Room 111. Co-sponsored with Art History Program, Department of Art and Museum of Art. Mark Klett is a pioneer in the field of re-photography. Using his training as a geologist, Klett positions his camera at the precise location of classic views of the west. Through his lens we see persistence, change, and the ways in which these disarmingly grand views of the west were framed to highlight characteristics of the landscape. Byron Wolfe’s photographs connect his interests in time, change, and place. Both Klett and Wolfe have received Guggenheim Fellowships to support their work. The symposium will feature invited presentations that explore the themes of nationhood, citizenship and belonging; values and social otherness; borders; questions of social justice; individual, national and cultural identities; the ways in which people reinvent themselves, their cultures and their worlds in new contexts; and the role language plays in controversial conversations such as assimilation and education. Featured speaker will be Pulitzer Prize-winning journalist Antonio Vargas, who, in a June 2011 essay in The New York Times Sunday Magazine, revealed his status as an "undocumented immigrant" in order to promote dialogue about the immigration system in the U.S. Vargas is the founder of "Define American," a non-profit organization intended to open up dialogue about the criteria people use to determine who is an American. Memories of Heart Mountain: As experience by former prisoner Sam Mihara. Thursday, September 25, 2014 from 4:30-6:30 p.m. in the Classroom Building, Room 310. AIS is excited to welcome Dr. Colin Samson from the University of Essex for two public events in September related to his research on First Nations sovereignty. They are: http://www.nirgunfilms.com/index.php?/film/nutak--in-progress/. A screening of the documentary film Nutak - Memories of a Resettlement, followed by Q&A with Samson, who ws the project consultant for the film. This takes place Tuesday, September 16 at 7:00 pm in Business 127. You can read a little about the film here: http://www.nirgunfilms.com/index.php?/film/nutak--in-progress/. A public lecture: "The Architecture of Dispossession: Neocolonialism and Neoliberalism in Aboriginal Land Claims Agreements in Canada." This takes place Wednesday, September 17, at 4:30 pm in Business 127. A summary of this lecture appears at the bottom of this message. Samson's visit is sponsored by the American Indian Studies Program, the Department of English, and the Office of Research and Economic Development. See WIHR Current Projects for project abstracts. All Presentations will take place in Classroom 103. Date: April 11, 2014, 8:00 a.m. – 1:00 p.m. The workshop will be divided into two sessions. Session 1 will consist of an introduction to Endowment programs and initiatives. John Cox, Senior Program Officer in the Division of Research Programs, will address the full range of funding opportunities in all the NEH divisions. Programs). Session 2 will be devoted to specific strategies for writing competitive applications and a better understanding the review process. This session will feature a “mock panel” using volunteers chosen from the pool of registrants and real applications submitted to NEH. The mock panel format addresses questions that frequently arise when writing proposals and demystifies the NEH’s peer review process. A question and answer period will be included in each session. Workshop participants will also be able to meet for individual, 15-20 minute consultations with Mr. Cox. These meetings must be scheduled through the WIHR office before April 2nd. In order to make the best use of this limited time, the Institute asks that each participant in this individualized portion of the program submit a one-paragraph summary of the grant project in advance. This will allow Mr. Cox to gather sample proposals, talk to colleagues, etc. and come to the meeting well informed. For these one-on-one sessions, preregistration is essential. Please register for the workshop by April 2, 2014 by contacting the Wyoming Institute for Humanities Research through Clayleen Rivord, our office manager (crivord@uwyo.edu). We will send further information on April 3rd. 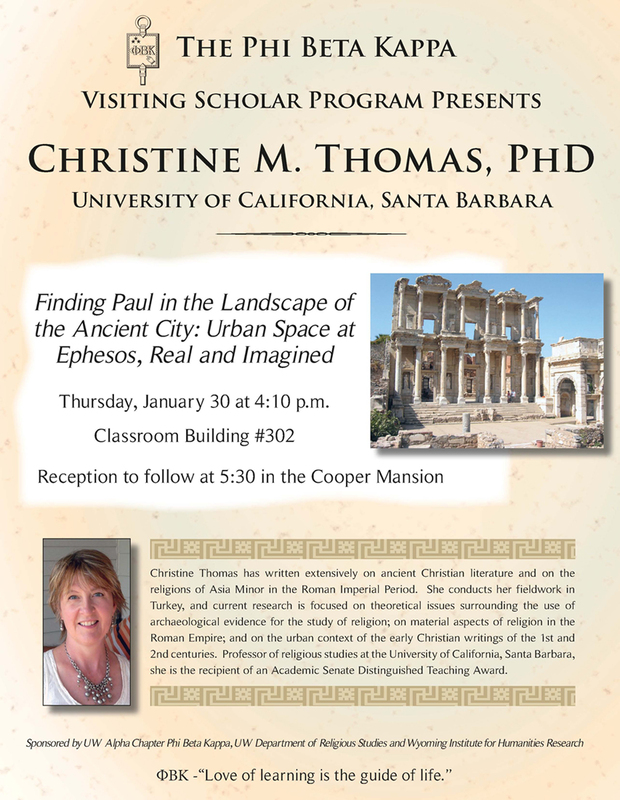 Thursday, January 30, 2014 at 4:10 p.m.
More than a century of archaeological work at Ephesos on the west coast of Turkey has unearthed impressive marble buildings in its urban center, locations dominated by the monuments of the wealthy and powerful. They are not necessarily representative, however, of the lived context of the overwhelming majority of the city’s ancient inhabitants. Recent survey work at Ephesos has developed the first detailed outline of the ancient coastline and of structures that provide a more complete picture of the urban landscape, and a more promising location for the social classes from which the first Christians were drawn. With the early Christian texts found in the New Testament, this evidence provides a vision of the city that is radically different its official and visible monuments, an “invisible city” existing alongside it. Patty Limerick will be giving a talk entitled, “Understanding the Underworld: Hydraulic Fracturing and the Depths of the Humanities,” at 4:10 on October 30th in the Wyoming Family Room, Wyoming Union, University of Wyoming main campus, Laramie Wyoming. Patty Limerick is the Faculty Director and Chair of the Board of the Center of the American West at the University of Colorado, where she is also a Professor of History. Limerick has dedicated her career to bridging the gap between academics and the general public and to demonstrating the benefits of applying historical perspective to contemporary dilemmas and conflicts. She will be speaking at the University of Wyoming as the first sponsored speaker of the new Wyoming Institute for Humanities Research. In October of 2012, the National Science Foundation Sustainability Research Network awarded a five-year, twelve-million-dollar grant to a consortium of scientists and engineers based at the University of Colorado. The goal of the grant is to provide the foundation for a more evidence-based consideration of natural gas development, maximizing the benefits of this resource while minimizing the negative impacts—on human and natural communities—of its production. The humanities-based Center of the American West holds the role of outreach and public communication in this collaboration, and by all indications, the Center’s participation was a key feature of the successful pursuit of the grant. This talk will cover the application of historical and literary perspectives to a vexing and contentious policy issue. Placing perceptions of hydraulic fracturing in the broader picture of human efforts to understand and envision the subsurface, Limerick will advance a proposition that she believes in the core of her soul: the humanities hold a great deal more promise for benefiting society than most members of the public—not to mention many humanities scholars themselves!—now realize. In the seemingly intractable and polarized debate over hydraulic fracturing, research in the humanities can offer perspectives never anticipated—and therefore not yet dismissed or rejected—by the opponents and contestants who have carried on that debate with such vigor. 2:00 p.m., Dr. William Eamon of New Mexico State University, will present "Medicine as a Hunt: The Pursuit of Secrets in Renaissance Science"
Abstract: Basically, I aimed to incorporate some of the themes you suggested, about medicine, language, and so forth. I'm going to talk about the metaphor of science/medicine as a hunt in the Renaissance and its implications for early modern medicine and natural history. This film is a savage satire about healthcare for the aged in the 21st century. As the story opens, scientists are alarmed that there are too many old people. A group of scientists and hospital administrators, under the direction of the Ministry of Public Welfare, develop a computerized hospital bed with robotic features. The Z-001 takes complete care of the patient and is driven by its own built-in nuclear power reactor. A compassionate young nurse, determined to help an elderly man strapped to one of these revolutionary healthcare beds, starts a series of unexpected consequences. Thus begins a wild chase through the busy streets of Tokyo as the supercomputer/bed/life-support system begins to have the personality of the old man's ex-wife (who just wants to spend the afternoon at the beach) as the government's secret project unfolds. Written by major anime figure Katsuhiro Otomo, whose “Akira” (1990) was an animated vision of a nightmare future urban world. Abstract: This talk considers representations of gastrointestinal disorder and distress in women by examining nineteenth century and contemporary medical discourse, with attention to the loss of patient narrative in an age of pain assessment, and the role of advertisements that encourage women to self-diagnose and cure loosely-identified GI problems.